Enjoy the weather graduation season brings and get out of the house and have fun. We have a large selection of tent sizes, the most popular size is 20×30 that handles 40-60 people. 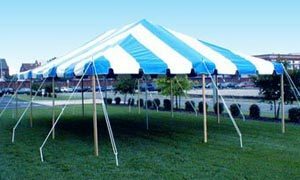 Pole Tents are available in a 10×10 size and up, they feature a canvas top held in place by center poles, side poles, ropes and stakes. Pole tents are great when you want them set up in your yard, over asphalt and so on. Frame Tents are available in sizes from 10×10 to 20×40. Since they are a free standing made out of tubing with a canopy secured over the top of it, you have more flexibility in choosing an installation location. A 15×15 Canopy is also available.